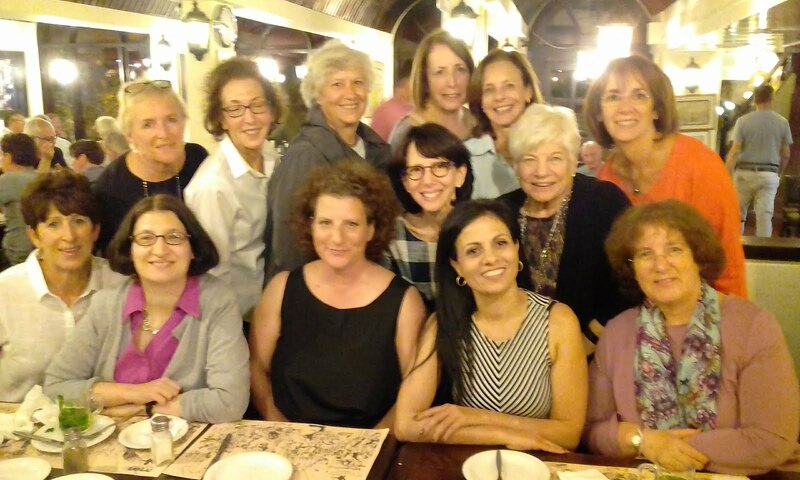 We were fortunate to have dinner with two of our Israeli Bernice S. Tannenbaum Prize winners: 2014 winner Yifat Bitton, founder of Tmura, and Lilach Tzur Ben-Moshe, the 2016 winner, who founded Turning the Tables. Bitton, second from right in the first row, uses the legal system to fight for the rights of women, and Ben-Moshe, pictured to her left, works with women exiting prostitution. The Tannenbaum Prize is awarded annually to an emerging leader in Israel or the US who has advanced the cause of girls and women. The previous night at dinner, we were able to catch up with the inaugural Tannenbaum winner, Vardit Dameiri Madar, a social justice lawyer who recently left her long-time position at Foundation grantee Yedid for a new job heading up the legal clinic at Hebrew University.